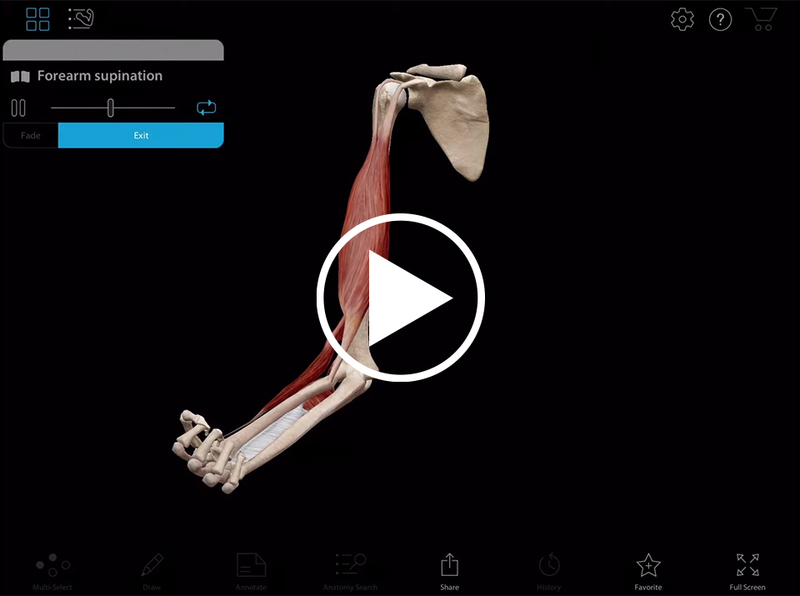 Rotate the 3D model to see how the biceps brachii muscles flex the elbow joint. There are over 600 muscles in the human body. Learning the muscular system often involves memorizing details about each muscle, like where a muscle attaches to bones and how a muscle helps move a joint. 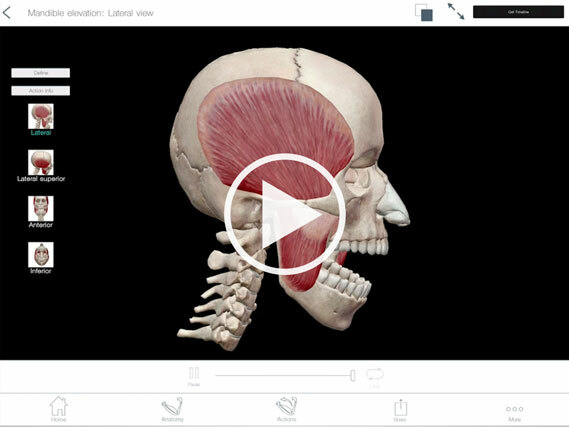 In textbooks and lectures these details about muscles are described using specialized vocabulary that is hard to understand. Here is an example: The triceps brachii has three bellies with varying origins (scapula and humerus) and one insertion (ulna). It is a prime mover of elbow extension. 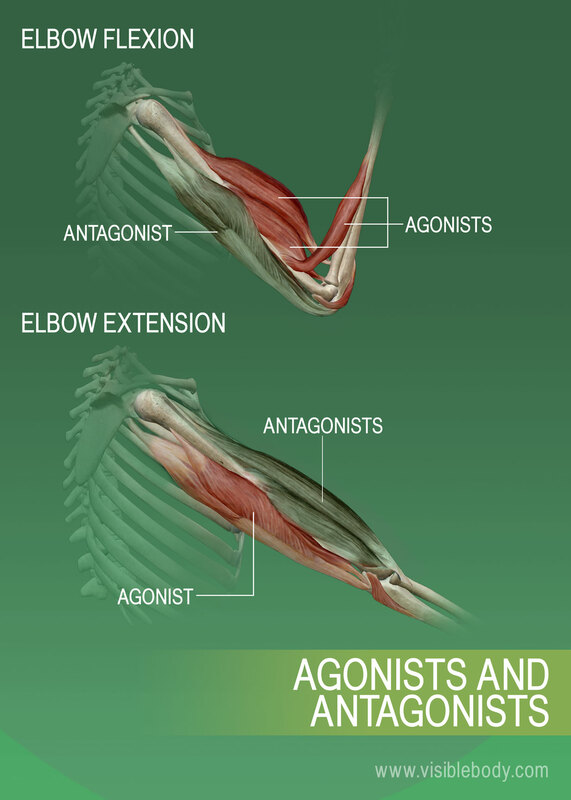 The anconeus acts as a synergist in elbow extension. What does all that textbook jargon mean? The triceps brachii has four places where it attaches to the scapula, humerus, and ulna. This muscle plays a big role (that’s what prime mover means) in extending the elbow joint from a bent to a straight position. The smaller anconeus is a synergist in elbow flexion. It assits. Keep reading to learn what all the other muscle jargon means! A skeletal muscle attaches to bone (or sometimes other muscles or tissues) at two or more places. If the place is a bone that remains immobile for an action, the attachment is called an origin. 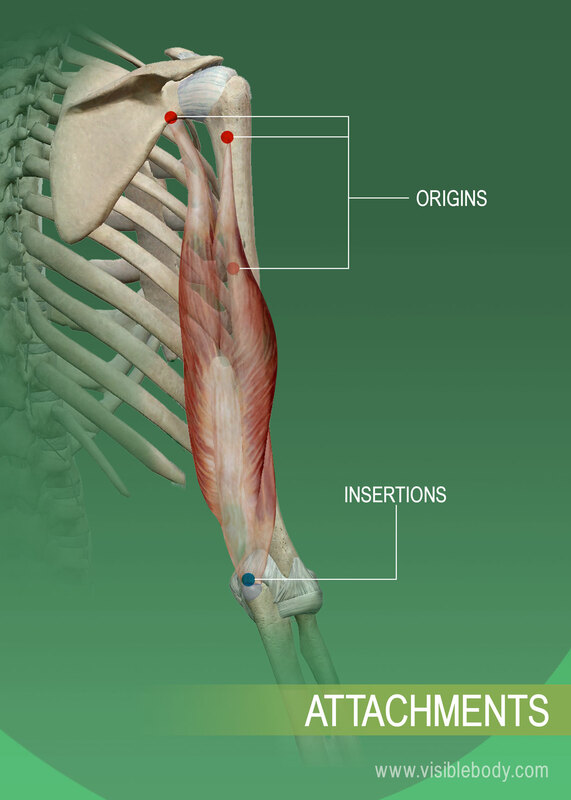 If the place is on the bone that moves during the action, the attachment is called an insertion. The triceps brachii happens to have four points of attachment: one insertion on the ulna and three origins (two on the humerus and one on the scapula). The muscles surrounding synovial joints are responsible for moving the body in space. These muscle actions are often paired, like flexion and extension or abduction and adduction. 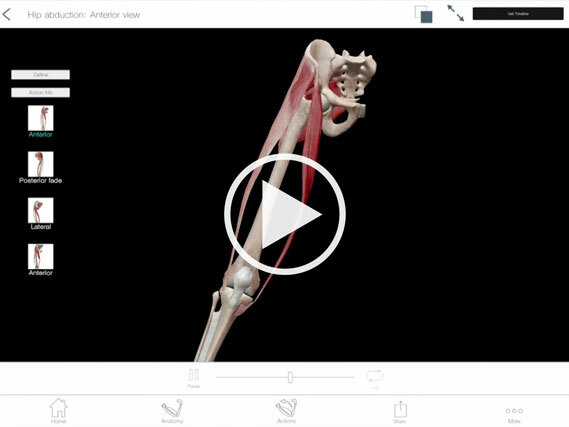 Below the common terms are listed and defined, with animations to help you picture the muscles and joints in motion. Flexion and extension are usually movements forward and backward from the body, such as nodding the head. Flexion: decreasing the angle between two bones (bending). Extension: increasing the angle between two bones (straightening a bend). The triceps brachii and anconeus are muscles that extend the elbow. The biceps brachii, brachialis, and brachioradialis flex the elbow. Abduction and adduction are usually side-to-side movements, such as moving the arm laterally when doing jumping jacks. Abduction: moving away from the body’s midline. Adduction: moving toward the body’s midline. The gluteus medius, gluteus minimus, tensor fasciae latae, and sartorius are muscles that abduct the hip. The pectineus, adductor longus, adductor brevis, adductor magnus, and gracilis adduct the hip. Describing the rotation of the forearm back and forth requires special terms. Spread your fingers out and look at the palms of your hands and the fingers and then rotate your palms to look at your nails. Now look at your palms again. That’s forearm supination and pronation. Pronation: rotating the forearm so the palm is facing backward or down. Supination: rotating the forearm so the palm is facing forward or up. Elevation and depression are up-and-down movements, such as chewing or shrugging your shoulders. When you move the mandible down to open the mouth, that’s mandible depression. Move the mandible back up, that’s mandible elevation. Elevation: moving a body part up. Depression: moving a body part down. By moving your jaw back and forth in a jutting motion, you are protracting and retracting your mandible. 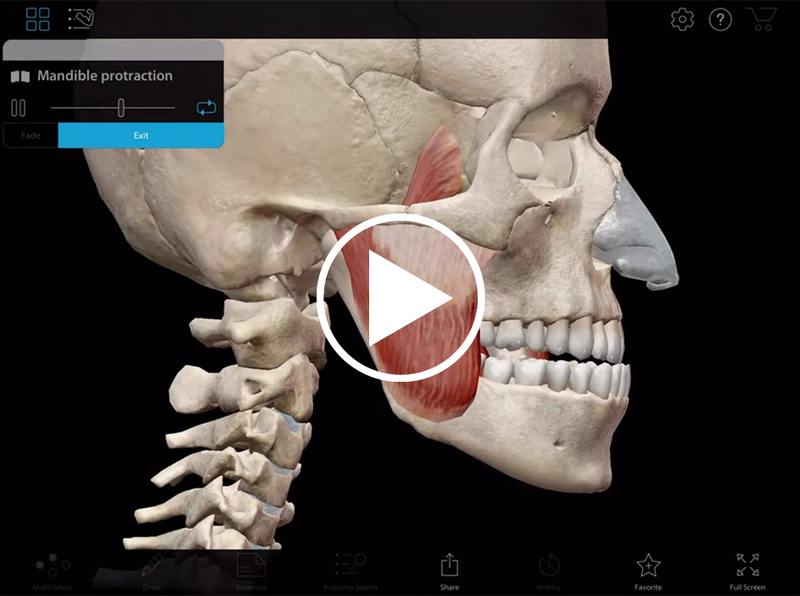 Protraction: moving a bone forward without changing the angle. Retraction: moving a bone backward without changing the angle. You invert your foot when you turn it inward to see what is stuck under your shoe. You evert your foot to put the sole of your shoe back on the floor. Dorsiflexion and plantar flexion You dorsiflex your feet to walk on your heels, and plantar flex them to tiptoe. Dorsiflexion: bringing your foot upward toward your shin. Plantar flexion: depressing your foot. While many muscles may be involved in any given action, muscle function terminology allows you to quickly understand the various roles different muscles play in each movement. The prime mover, sometimes called the agonist, is the muscle that provides the primary force driving the action. An antagonist muscle is in opposition to a prime mover in that it provides some resistance and/or reverses a given movement. Prime movers and antagonists are often paired up on opposite sides of a joint, with their prime mover/antagonist roles reversing as the movement changes direction. Synergists. One or more synergists are often involved in an action. Synergists are muscles that assist the prime mover in its role. Stabilizers. Stabilizers act to keep bones immobile when needed. Your back muscles, for example, are stabilizers when they are keeping your posture sturdy. Muscle Premium by Visible Body offers a comprehensive reference of musculoskeletal structures and function, plus common injuries and conditions.